Our new Compass Kensington 860 is shown below, for more information please contact us. 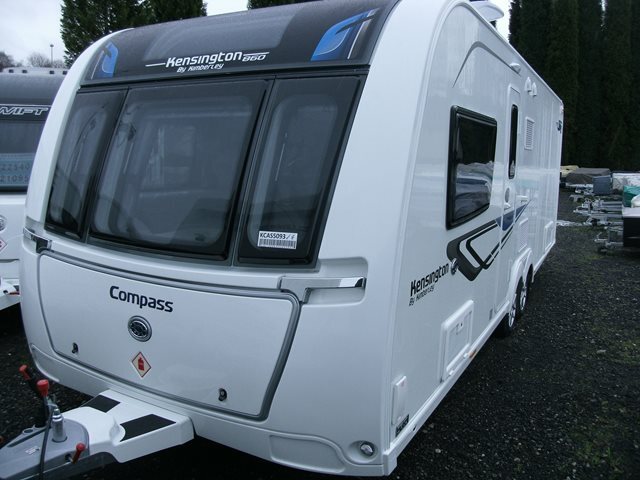 We are delighted to bring the Kimberley Caravans dealer special Compass Kensington to the West Midlands! Based on the Casita it features a host of extras including GRP sides, alarm, external BBQ & 230v points, Aquaclean upholstery and stargazer rooflight. Add to this the standard features of microwave, AL-KO ATC stability control and Whale duel-fuel space saving heating and you get a fantastic specification at an affordable price. This four berth 860 is 8 foot wide and features parallel bench seats to the front, mid kitchen, split mid wash room and a rear transverse island bed. For any further information please contact us on 01384 413336 and ask for a member of the sales team.